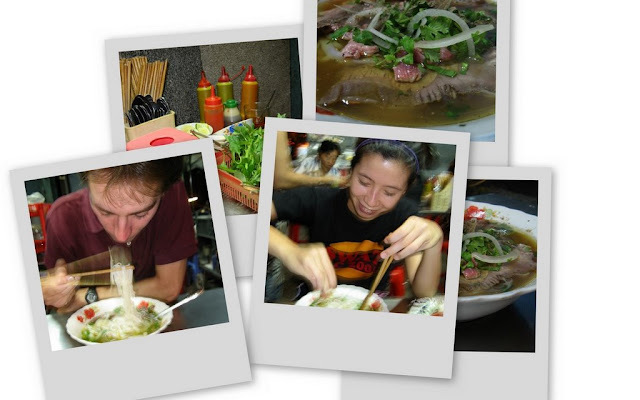 Frequent readers of the blog will have no doubt noticed that The Gastronomer and I don’t eat pho very often. It’s not that we dislike it, but it just doesn’t excite us the way a good bowl of bun bo or bo kho does. 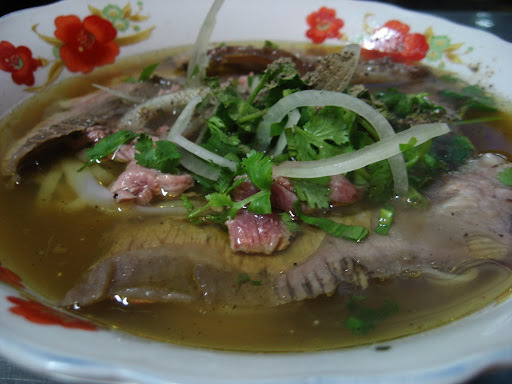 In the Saigon heat, a noodle soup had better be damn good to make the requisite sweat bath seem worthwhile. The environment in Hanoi is more conducive to eating pho (from October to March that is…), but I actually like the sweeter, more flavorful southern version better, so for a long time it seemed that I was just out of luck. However, a few months ago we were driving home and noticed an amazing fragrance drifting across Nguyen Khoai Street in District 4. It was coming from a roadside pho stand that we had never noticed before. Driving around on a motorbike in Saigon, you breathe in a lot of dust and come across a wide variety of aromas, some of them terrifying. However, the opportunity to discover hidden culinary gems purely by smell is one of the coolest things ever. 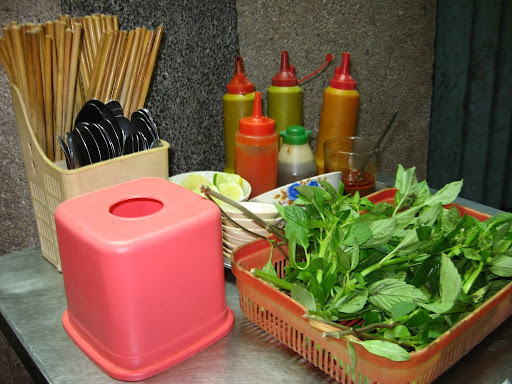 The scent of this pho cart was one of the most alluring we’d ever encountered. We resolved to return for a meal as soon as possible. I was quick to follow through on this promise. After my first bite, I knew that we had indeed found the best pho bo in town. The flavor was magnificent—no need to squirt in large quantities of hoisin and hot sauce to make the broth interesting. It was substantial enough to make me want to dip banh mi in it and soak up the leftovers, an honor previously reserved for bo kho. The dominant scent and flavor was star anise, subtly accompanied by a number of other spices. Everyone puts star anise in their pho, but the taste of this place’s broth is unmatched. I think their secret may be as simple as just adding more of it. My enjoyment was heightened by the addition of beef brisket (nam) to the bowl. Previously I had only tried pho tai (small pieces of rare beef), but nam definitely adds to the experience. On The Gastronomer’s first visit to the stall, they had run out of her personal favorite cow part, the stomach lining (sach). Nevertheless, she agreed that the broth was delicious. The smell is key—it permeates the senses as you eat, allowing you to spend the entire meal in a state of relaxed bliss. There used to be another pho restaurant on Nguyen Khoai, but they recently switched to selling com ga xoi mo and mi xao. I’m pretty sure they were run out of business. wow imagine that, finding that by the aroma alone, and no need for extra hoisin or sriracha… that looks amazing! That looks awesome. Did you ever tried Pho 24? we were there 2 weeks ago at the store on Le Thanh Ton St, and it was awful, absolutely no taste. Maybe we just had a bad luck that day. Pho 24 is awful. No offenese, but i blame Viet Kieu for that. It is so cool that The Gastronomer like Beef Tripe. Astronomer, welcome to the land of Na.m . I love it more than the Ta’i. It is rainy in Florida right now due to some tropical storms and your entry made me want to have Pho*? so badly. nhbilly and foodhoe: Indeed—it is wonderful. beautran and Duy: We did go to Pho 24 once. I actually thought the broth was above average, but it couldn’t compare with the best of the best. With the skimpy portions and high prices, I had no real desire to go back. 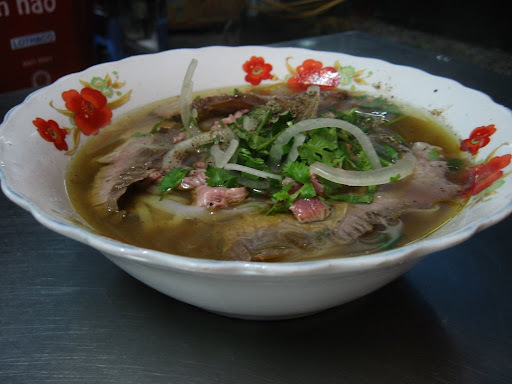 Has anyone had phở in Hanoi? They had this peculiar aroma, not necessarily unpleasant, that I just couldn’t pinpoint. My friend told me it was MSG, but I’ve never seen MSG with that taste or smell.